Here are some things to keep in mind while you and your kiddos are out and about enjoying summer. Supervision is a top priority any time children are around water at home, at the pool or at the lakes. A small child can drown in just an inch of water. NEVER LEAVE a CHILD ALONE in or near ANY body of water, large or small. Anticipate needs. Keep things like your phone, towels, tissues, first aid kit, sunscreen, drinks, etc. within arm’s reach at the pool or beach. DO NOT leave children to go get anything! Remain alert and watch children. Do not be distracted by activities like reading, sunbathing or visiting. Be trained in First Aid and CPR and know response for an emergency. Flotation devices are fun but they are NOT A SUBSTITUTE for SUPERVISION. 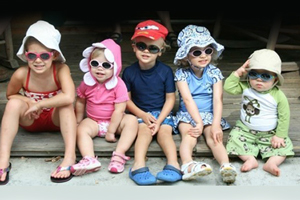 Be sure your child care maintains appropriate staff to child ratios for swimming/wading activities. A life guard is should not be counted as staff. Babies and young children are more susceptible to sunburn because their skin contains less melanin (dark brown/ black pigment). Just one blistering sunburn as a child or more than five serious sunburns in a person’s lifetime can more than double the risk of developing skin cancer. Here are some tips to limit their exposure. Sun rays are strongest between 10 am and 4 pm. Avoid outdoor play time for children between 11:00 am and 2:00 pm. Keep children under the age of 6 months out of direct sunlight at all times. Apply sunscreen 20-30 minutes before going outside to allow the ingredients to fully bind with the skin. Reapply sunscreen every 2 hours, especially if a child is sweating or playing in water. Sunscreen is not recommended for children under 6 months of age. Follow Center for Disease Control (CDC) and American Academy of Pediatrics (AAP) AAP age and formula guidelines when using mosquito, tick and biting insect repellents on and around children. Insect repellent is not recommended for children under 2 months of age, Use netting or clothing instead to block insects. The AAP has approved 10-30% DEET (N,N-diethyl-m-toluamide) for children 2 months old or older. No products with more than 30% DEET should be used on children. A higher concentration of deet doesn't mean a product is stronger, only that it lasts longer. Keep children indoors at dawn and dusk when mosquitos are most active.